On Sunday, we observed Kalaupapa Sunday. 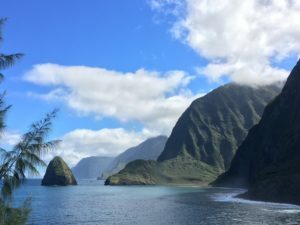 Churches throughout Hawaii remembered Kalaupapa this week as that isolated peninsula on the north shore of Molokai where the Hawaiian government sent people who had Hansen’s Disease (leprosy) to live and die there separated from family and community. I began my message by sharing the tragic story of the murder of Dr. Jared Knapp Smith in 1897. Jared grew up right here in Koloa, the son of Dr. James and Melicent Smith, who arrived here in 1842. James was the only Western-trained medical doctor on the island and served all of Kauai and Niihau. Jared went to college and medical school in New England, and returned to Koloa to follow in his father’s footsteps. He not only had a busy medical practice but also started Koloa Industrial School for boys (after his family started and ran Koloa Boarding School for Girls). He met Margaret Brewer of Honolulu and fell in love. They were engaged to be married. One September evening, Jared sat down in his room and wrote her a letter. Just before he finished writing, he thought he heard a knock on his door. His life ended that night. When I shared the entire story on Sunday, I made the connection between Kalaupapa, on the island of Molokai, and Koloa, for it was because of the dread of loved ones going to Kalaupapa that Jared Smith was murdered. I reminded the congregation that Kalaupapa affected every community throughout Hawaii. Our Gospel reading on Sunday was Luke 5:12-16—the story of a man with leprosy who dared to cry out in Jesus’ presence, “Lord, if you choose, you can make me clean.” This was an outrageous and illegal request. I pointed out the command in Leviticus that people with leprosy were to yell from a distance, “Unclean! Unclean!” The man was actually breaking the law by even being close enough to Jesus to make his request. Jesus also broke the law! He was not allowed to be that close to the man; and yet, he touched the man with leprosy—thereby making himself unclean. In the eyes of Jesus’ society, Jesus himself was unclean in God’s eyes, and deserved to be separated both from God and community. And yet, Jesus made a choice to touch the man! “I do choose,” said Jesus, “Be made clean.” We too get to choose whether or not we separate and divide people on the margins of society or risk scorn and ridicule from others by reaching out and touching with compassion all those who suffer emotionally, physically and spiritually. Jesus made it clear which was the better choice. Two weeks prior to Sunday, I stood at Kalawao on Kalaupapa Peninsula with my son Palani. I took in the stunning beauty of the place and was reminded that this was the most dreadful place in the world for Hawaiians (and others living in Hawaii) with leprosy in the late 19th and early 20th centuries. What irony: sadness, loneliness and terror at a place of such incredible beauty. And yet, this is part of the human story—even in our darkest moments, God shows up in light and beauty, reminding us of a loving presence that sustains even the worst times that we face. May we all open our eyes and our hearts so that we will see the beauty—even during the darkest moments of our lives.